It was a task worthy of Hercules. How could Richard Rodgers and Oscar Hammerstein II repeat the phenomenal success of Oklahoma! in 1943? The critics had hailed the show as the coming of age of the American musical theatre in which book, music and lyrics were fully integrated in service of the narrative and the psychological make-up of the characters. The writing partners ranged far and wide in their search for a suitable source but nothing apparently sparked their imagination until Rodgers, who had a house in Connecticut, saw the possibility of a story set in a fishing community on the coast of Maine in 1873. Then they turned their attention to Liliom, a play by the Hungarian dramatist Ferenc Molnar, perhaps best known in this country as the author of The Guardsman. Liliom, reportedly Hungarian slang for a tough guy, is a smooth-talking fairground barker, the lord of all he surveys as he struts around his carousel. Molnar’s original play had been a success on Broadway in 1921 and a subsequent London production had featured Ivor Novello and Charles Laughton in the cast. Composers Puccini and Kurt Weill had seen the operatic potential in Molnar’s story, but the Hungarian refused to give way to their proposals. 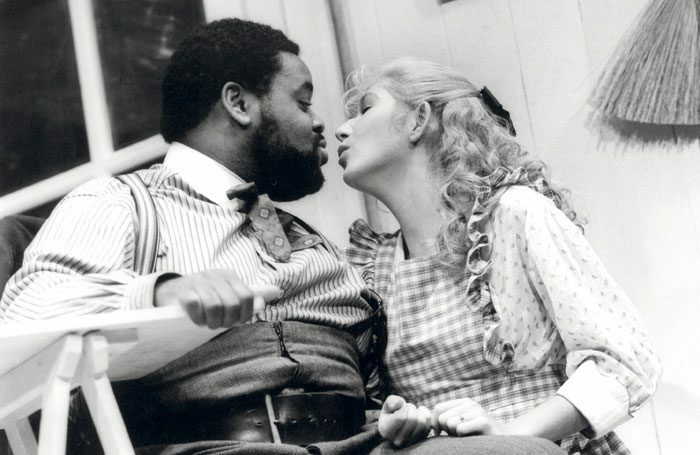 He was similarly reluctant to agree to Rodgers and Hammerstein’s approach until he went to a performance of Oklahoma!. The experience left him marvelling at the partners’ ability to turn the relatively minor Green Grow the Lilacs into a blockbuster musical. With Molnar now on board, the way was clear for the development of Carousel. In retrospect, it seems an odd choice on the part of Rodgers and Hammerstein, who seldom stinted on the saccharine, to make a hero of Billy Bigelow, the new name for the character of Liliom. As quickly becomes clear when Carousel’s plot unfolds, beneath the facile charm, Billy is a petty crook, thief and wife-beater who kills himself to avoid a prison sentence, leaving his partner pregnant with their daughter. Billy is then accommodated in a kind of purgatory or “heaven’s waiting room”, while the celestial authorities decide his fate. Is it the fiery furnace or a heavenly hereafter for our anti-hero? Can Billy redeem himself at the last? For all Rodgers and Hammerstein’s belief in the best of human behaviour, they did not always view characters through rose-tinted spectacles. Their five great musicals contain ample evidence of the darker side of life, such as the sinister, hulking Jud in Oklahoma! or the Nazis in The Sound of Music. 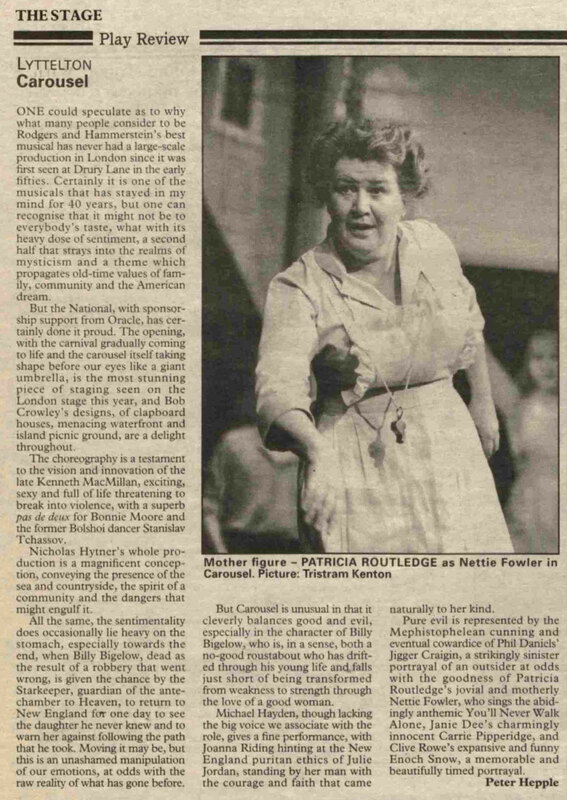 The Stage review of the National production of Carousel in 1992. Click to enlarge. 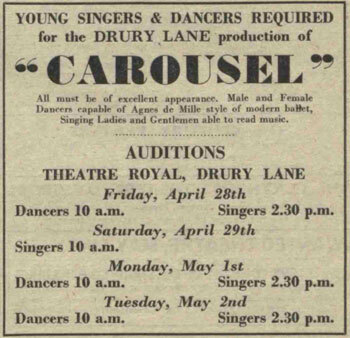 Carousel opened at the Majestic Theatre on Broadway in April 1945, only a few weeks before VE Day. One wonders if the message of hope in the final moments of Carousel was a product of these more optimistic times. 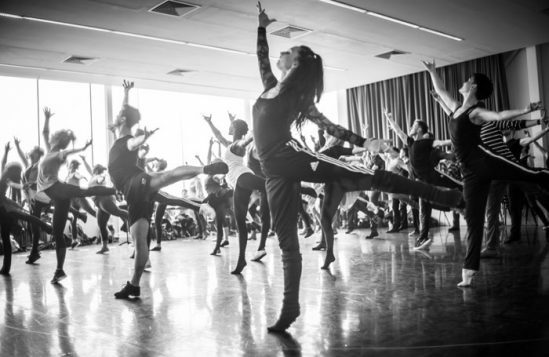 It has been regularly revived, including a National Theatre production in 1992 that powered its way to Broadway, garnering Oliviers and Tonys en route. Making a considerable impression as the upwardly mobile Mr Snow in this production was Clive Rowe, now preparing for a solo appearance at London’s Ivy Club on May 6. Carousel’s unlikely denouement and the involvement of the afterlife might not seem to appeal to a contemporary audience. 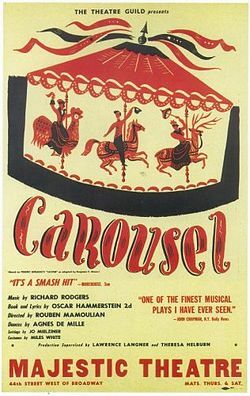 Carousel was said to be Rodgers’ personal favourite of his musicals, a view supported by Time magazine, which declared it the musical of the century in 1999.